The 2014 Dodge Dart is the first product of joint Fiat-Chrysler and it is based on the Alfa Romeo Giulietta platform. “Dart” is the name of a successful Dodge’s compact of the 1960s and 70s. 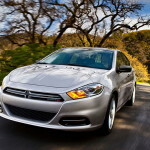 The Dart is now Dodge’s first offering in the compact sedan segment since the Neon was discontinued in 2005. The new Dodge Dart has an attractive interior made with a blend of soft-touch and hard plastic surface that are well-constructed. Front seats are supportive and there is an ample space in the back. The new Dart also offers a comfortable ride, a responsive handling and well-weighted steering. The 2014 Dart competes with the Kia Forte, Mazda3, Ford Focus, Chevy Cruze and Honda Civic. The five-passenger Dodge Dart is a compact sedan that is offered in five trim levels: SE, SXT, Aero, GT and Limited. The base SE comes standard with 16-inch wheels, a height-adjustable front seats, a tilt-and-telescoping steering wheel, power windows, cloth upholstery and a 4-speaker audio system with a CD player. An auto-dimming rearview mirror, cruise control, air conditioning, keyless entry, power mirrors, steering-wheel-mounted audio controls and Bluetooth connectivity are all available as options. The SXT model adds to the SE with options a sliding front armrest, automatic headlights, 16-inch alloy wheels and a six-speaker audio system. The Uconnect Touchscreen package adds a 8.4-inch touchscreen interface, a rearview camera and a 9-speaker Alpine sound system, while the Rallye Appearance Group adds a sport tuned suspension, dual exhaust tips, a leather-wrapped shift knob and 17-inch alloy wheels. The new Aston Martin V8 Vantage N430 is a special edition of Aston Martin’s V8 Vantage which will be shown for the first time at the 2014 Geneva Motor Show on March. The N-badged cars of Aston Martin are all developed using experience gained from Vantage GT race cars. In this case, the Vantage N430 is inspired by the Vantage GT4 race car. Available in coupe and roadster form, the V8 Vantage N430 has all the same curves and dimensions of a standard V8 Vantage, but adds a slew of menacing dark-themed accents, graphite-painted corners and forged-alloy wheels. The Kevlar and carbon-fiber seats also contribute to creating a general image of a “bad car”. The name “N430” comes from the powerful 4.7-liter 32-valve V8 front mid-mounted engine that produces 430 horsepower and 361 pound-feet of torque. The engine is paired with either a six-speed manual transmission or a seven-speed SportshiftsII automated transmission with paddle shifter. The N430 can accelerate from 0 to 60 mph in 4.6 seconds and has a top speed of 190 mph. The 2015 Chrysler 200 is fully redesigned as a large midsize sedan and offers now more styling, more upscale interior and improved performance. 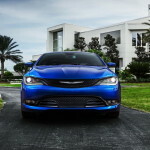 The five-seat Chrysler 200 comes now with a completely new grille and headlights, an updated Chrysler badge, standard full-LED daytime running lamps, LED fog lamps, LED taillamps and also an all-new 9-speed automatic transmission. The 2015 Chrysler 200 is offered in four trim levels: LX, Limited, 200S and 200 C. The Chrysler 200 LX comes standard with 4-way front headrest seats, 6-way manual passenger seat, 60/40 rear seats with trunk Pass-Thru, 6-way driver seat, 12-volt power outlets in center console and on passenger side console, air conditioning, front center sliding armrest, full-length floor console with storage, outside temperature gauge, power windows with driver’s One-Touch-Down feature, a tilt-and-telescoping steering column, steering wheel-mounted audio controls, ambient LED interior lighting, automatic headlamps with turn-off time delay, LED tail lamps, tinted windshield glass, 17-inch steel wheels and a 4-speaker audio system with integrated window antenna and USB port. The Limited model adds premium cloth bucket seats, a compass gauge, GPS antenna input, a rearview mirror with microphone, 17-inch Tech Silver aluminum wheels as standard, bi-function halogen projector headlamps, a 6-speaker sound system with 5.0-inch touchscreen display and Uconnect voice command with Bluetooth. Heated front seats, a 8-way power driver seat with 4-way power lumbar adjust, dual-zone automatic climate control and remote start system are available as options. First introduced in 2008 and revised in 2012, the Audi A5 delivers a good balance of styling, interior comfort, fuel economy and performance. 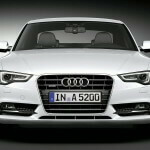 The 2014 Audi A5 is offered in four-passenger coupe and Cabriolet (convertible) body styles and competes on the market with BMW 4 series, Infiniti Q60 and Mercedes-Benz C-Class. The 2014 Audi A5 comes in Premium, Premium Plus and Prestige trim levels. The base Audi A5 Premium trrim level comes standard with 18-inch alloy wheels, tri-zone automatic climate control, automatic lights and wipers, a sunroof (coupe), eight-way power front seats, leather upholstery, split-folding rear seats and a dash-mounted MMI electronics interface controller with a 6.5-inch display and Bluetooth connectivity. Also present on the A5 Premium is a 10-speaker sound system with a CD player and an iPod interface. The Cabriolet adds a power-operated convertible top and a wind deflector. The Premium Plus trim level adds xenon headlights, LED running lights and taillights, keyless ignition, keyless entry, auto-dimming and heated mirrors, driver-seat memory functions, heated front seats, front and rear parking sensors, a navigation system, an upgraded MMI interface with 7-inch display, a rearview camera and Audi Connect. The Audi A5 Prestige model adds adaptive headlights, a blind-spot monitoring system and a premium 14-speaker Bang & Olufsen audio system.